MRBTN Notification is out. MRBTN is recruiting for 2345 Nurses Govt Job Posts. 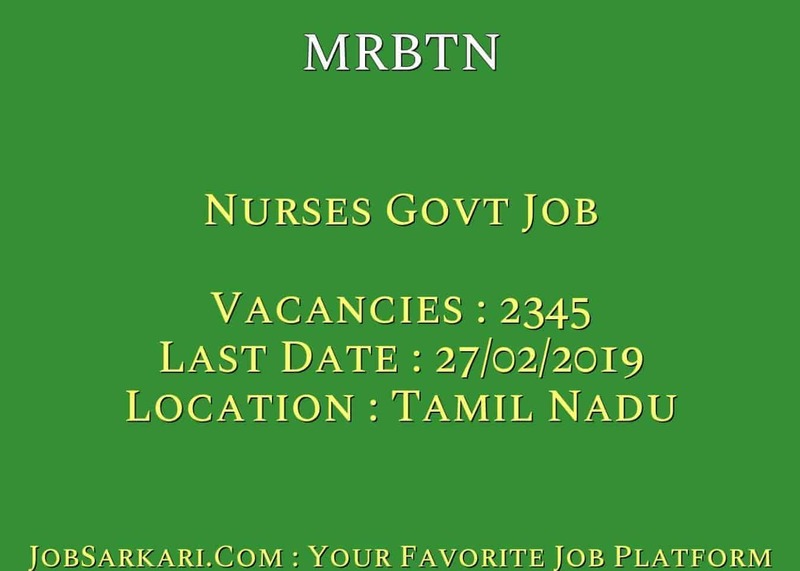 You can check MRBTN - Medical Services Recruitment Board Tamil Nadu last date, download MRBTN notification, visit MRBTN official website and check other MRBTN Vacancy details.Complete Vacancy and recruitment Details about 2345 Nurses Govt Job vacancies in MRBTN are provided below by JobSarkari.Com only for you. Last Date for Apply Online. 27/02/2019. Last Date for Payment of Application Fee. 01/03/2019. G 443 380 51 287 214 43 13 1431. W 191 162 21 123 93 18 07 615. PWBD (G) 19 15 02 12 10 01 01 60. PWBD (W) 08 08 01 05 03 01 00 26. PWBD (Backlog) G 17 13 02 13 11 02 00 58. PWBD (Backlog) W 52 42 06 31 21 03 00 155. Total No. of Post 730. 620. 83. 471. 352. 68. 21. 2345. Candidate Must Have Passed Degree or Diploma in Nursing with Not Less Than 03 Years Academic Duration and Registered with the Tamil Nadu and Midwives Council. Maximum Age For Other Category. 35 Years. Maximum Age For PH. 57 Years. 3. Register Before Applying for the Post already Register Candidate Not Need to register Again. 4. Candidate Need to Fill All the Mandatory Details in the Application Form and Complete Registration Form. 5. After Successful Registration System Will Generate a Login ID and Password. 6. Login With the ID And Password and Complete the Application form. 7. Candidate Need to Upload the Scanned Copy of Document in the Prescribed Size and format as Mention in the Application form. 8. Candidate Need to Take Printout of your Application form for future Reference. 9.Online Application can be Submitted on or Before 27th February 2019. Q. What is the Last Date For MRBTN Nurses Govt Job Vacancy ? A. 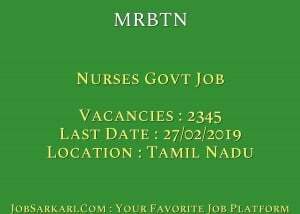 Last Date for MRBTN Nurses Govt Job Posts is 27/02/2019. Q. What is the Form Type of MRBTN Nurses Govt Job Recruitment ? A. The Form Type for MRBTN Nurses Govt Job Posts is Online. Q. How many vacancies are available in Medical Services Recruitment Board Tamil Nadu Nurses Govt Job Posts ? A. There are about 2345 Vacancies in Medical Services Recruitment Board Tamil Nadu Nurses Govt Job Posts. Q. What is the Full Form of MRBTN ? A. Full Form of MRBTN is Medical Services Recruitment Board Tamil Nadu .